Pattern instructions complete on this page. Finished afghan measures 38 x 62 inches. » 13 skeins of No. 909 Scarlet. Each motif on this afghan measures 4 inches square. Starting at center with White, ch. 6. Join with sl st to form ring. 1st Rnd: Ch. 3, 15 dc in ring. Join to top of ch-3. Break off. Attach Scarlet to same place as sl st, 3 sc in same place, *sc in next 3 dc, 3 sc in next dc. Repeat from * around. Join and break off. Attach White to first sc, sc in same place, * at base of 3-sc group make dc, ch 2 and dc (2 long dc made); sc in 3rd sc of same sc group, (make a long dc over next sc, sc in next sc) twice. Repeat from * around. Join and break off. Attach Navy to corner sp, in same sp make sc, ch 2 and sc; sc in each sc and in each dc around, making sc, ch 2 and sc in eac corner sp. Join and break off. 5th Rnd:Attach White to corner sp, sc in same sp, make long dc in same sp; * (sc in next sc, long dc over next sc) 3 times; sc in next sc, in corner sp make long dc, 2 sc and long dc. Repeat from * around. Join and break off. 6th Rnd:Attach Scarlet to first sc, (yarn over, insert hook in same sc, draw loop through) 3 times; yarn over and draw through all loops on hook, ch 1 to fasten (puff st made), *make a puff st in each of next 5 sc, in next sc make puff st, ch 2 and puff st. Repeat from * around, ending with puff st in same place as first puff st, ch 2. Join and break off. Work as for First Motif, reversing Scarlet and Navy rnds. 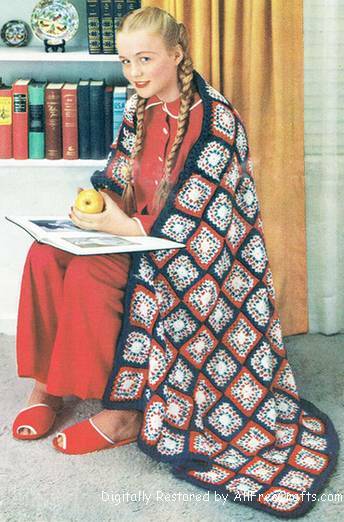 » P Coats and Clark published this Americana Afghan (C-124 pattern) in its O.N.T. Afghan Book No. 289. » “I am an American Day” and “Constitution Day” became “Citizenship Day” to be celebrated on September 17th each year. » President Truman lost the election to a landslide victory by Eisenhower. » Ronald Reagan appeared as Jeff Williams in the movie Hong Kong. Starting and ending with a Scarlet Block, sew 5 Scarlet and 4 Navy Blocks together to form first strip. Starting and ending with a Navy Block, sew 5 Navy and 4 Scarlet Blocks together to form second strip. Sew remaining blocks together in alternate pattern as before. Sew strips together. Attach Navy to any corner sp, make a puff st, ch 2 and puff st in same sp, make a puff st in each sp around, making puff st, ch 2 and puff st in each corner sp. Join. Sl st in corner sp and work as for firsst rnd. Join and break off. Block to measurements.